The thriving Spanish and Portuguese colonies in the Americas produced a wide array of objects that reveal a rich material life as well as complex cross-cultural exchanges between European and Native traditions. Since both Spain and Portugal were Catholic kingdoms, colonial art often reflects the influence of the church. For example, the devotional imagery featured here played an important role in sustaining the faith of the colonists and in converting indigenous peoples. Also on display are images of and adornments for the horse. In colonial societies such luxury objects and the ownership of horses symbolized social and economic standing. This special exhibition celebrates a major new installation in the Luce Visible Storage ■ Study Center that gives the public access to additional works from the permanent collections. During the next few months, more than 350 objects from the Museum’s extensive and renowned holdings of American art will be installed in the drawers of this alcove. Ranging widely in medium, date, and geographical origin, the objects share a diminutive scale and suitability for flat storage. As individual drawers are filled, they will be labeled and unlocked (locked drawers are not yet ready). We invite you to open the drawers and explore treasures that, though small in size, are of great artistic interest. Small Wonders highlights and elucidates some of the works that will be installed in the drawers, revealing a diversity of cultural traditions and artistic practices that constitute American art. A variety of jewelry and objects of personal adornment— although produced by different peoples—function similarly to signify information about the wearer’s identity. 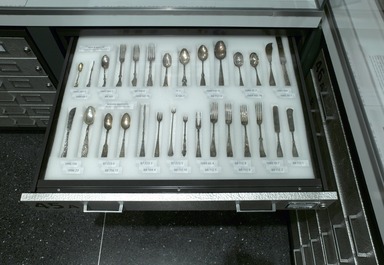 The flatware, pins, and other silver items on display reflect a broad array of forms, styles, and uses for this valuable metal. Ceramic tiles made contemporaneously by Native and non-Native Americans provide an interesting crosscultural comparison with respect to decoration and marketing. 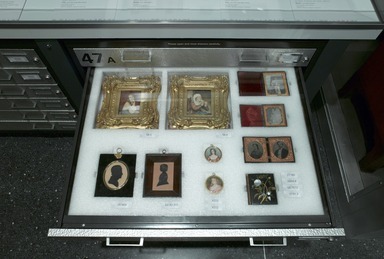 As in other sections of visible storage, objects in the drawers are grouped by type, medium, or culture and are densely installed to maximize the available space. The chart below lists the groupings and their locations (cabinet number followed by drawer letter). You may use the nearby computer kiosk to obtain more information: to learn more about an object, enter the accession number on its label; to get a list of a drawer’s entire contents, use the Map feature. In order to protect the objects, please operate the drawers carefully and do not lean on open drawers. Come back often to see what’s new and to enjoy the growing number of small wonders on view. A distinct branch of art, miniature painting thrived in America from the late eighteenth through mid-nineteenth centuries and again from the 1890s to the 1940s. In the earlier era, miniatures functioned as tokens of affection, typically depicting a portrait of a loved one or, less frequently, symbols of love and mourning. Artists created these tiny, treasured pictures with delicate strokes of watercolor on a thin ivory sheet; the natural luminosity of the medium endowed the subject with a lifelike glow. Miniature painting waned in the 1840s with the advent of photography—a new medium that provided accurate and inexpensive likenesses. Inspired by the Arts and Crafts movement’s advocacy of handmade objects, artists and patrons rediscovered the miniature genre in the late nineteenth century. Portraiture still dominated, but revival miniaturists experimented with a wider range of subjects, and more daring techniques in an effort to rival large-scale painting in aesthetic effect and importance. 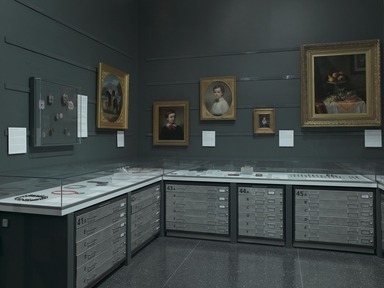 These drawers contain the Museum’s collection of American miniatures and related objects such as silhouette portraits, early photographs, and sentimental jewelry. A miniature painting consists of a diminutive watercolor-on-ivory picture—usually a portrait—housed in a piece of jewelry, a case, or a frame. During the late eighteenth and early nineteenth centuries, the miniature functioned as a token of affection that was treasured for its tiny likeness of a beloved friend or family member and often commissioned upon an engagement, marriage, or death. Its physical characteristics enhanced its sentimental associations: its small size required intimate viewing and allowed it to be carried or worn on the body (see illustration). Using tightly controlled, patterned brushstrokes, artists created portraits that glowed with the natural luminosity of watercolor and ivory. With the rise of photography in the 1840s, the miniature went into decline until a revival of the art at the turn of the twentieth century, when artists found new appreciation for the technical challenges and expressive possibilities of this painting format. Although they still used the traditional medium of watercolor on ivory (or, given trade restrictions, ivory-like substitutes), modern miniaturists explored a wider variety of subjects and styles. The function of the miniature changed, too. No longer primarily an object of personal devotion, the revival miniature was intended to convey a particular mood or aesthetic effect and to be exhibited as a work of art. The thriving Spanish and Portuguese colonies in the Americas produced a wide array of objects that reveal a rich material life as well as complex cross-cultural exchanges between European and Native traditions. The relicarios—lockets with devotional imagery—featured here reflect the influence of the Catholic Church in sustaining the faith of Spanish colonial populations and in converting indigenous peoples. Political affiliation is the subject of the stunning fan that portrays Brazil’s first independent emperor, Pedro I. The ivory material and stylized carvings in the sticks of this commemorative object were imported from China—evidence of South America’s vital role as a nexus for global trade. Also on display are images of and adornments for the horse. In colonial societies such luxury objects and the ownership of horses symbolized social and economic standing. Throughout Spain and Portugal’s colonies in the Americas, lockets known as relicarios were a popular form of devotional jewelry and religious expression. These pendants were worn or carried by clerics, nuns, and members of religious societies, as well as by lay Catholics. The devout fastened them to statues of favorite saints in thanks for answered prayers, while soldiers and travelers treasured them as protection from harm. Whereas European reliquary jewelry often incorporated bones, hair, and clothing fragments of the saints, colonial examples often were made from religious prints; souvenirs from pilgrimage sites; or portraits of the saints, Christ, or the Virgin Mary. The examples on view here include images of Our Lady of Mount Carmel and the Virgin of Copacabana, whose statue, located in the village of that name on the shores of Lake Titicaca, is associated with miracles. The sacred imagery of a relicario is held behind glass in a frame or mount with a loop at the top for suspension. The pendant is often two-sided, and a lock of hair, a prayer, a scrap of cloth, or another personal memento might be sandwiched between the two images. Although some relicarios integrated inexpensive religious print imagery, others—such as the image of the Virgin of Copacabana—were painted in minute detail. Whereas European reliquary jewelry often incorporated bones, hair, and clothing fragments of the saints, colonial examples often were made from religious prints; souvenirs from pilgrimage sites; or portraits of the saints, Christ, or the Virgin Mary. Examples here include images of Our Lady of Mount Carmel (accession nos. 48.206.34, .37) and the Virgin of Copacabana (41.1275.402), whose statue, located in the village of that name on the shores of Lake Titicaca, is associated with miracles. A relicario is often two-sided, with a lock of hair, a prayer, a scrap of cloth, or another personal memento sandwiched between the two images. Indigenous women of South America have adorned their bodies with silver ornaments for thousands of years. Large metal pins with disk-shaped heads called tupus were the primary ornaments worn by Andean women to fasten their dresses and shawls. During the colonial period tupus acquired European-inspired designs such as the one displayed here with an engraved double-headed eagle of the Habsburg Empire. Mapuche women of Chile and Argentina incorporated Spanish coins and other trade silver into the tupus, breast and head ornaments, and earrings on view here and in the drawers below. The flat silver disks that dangle from many later ornaments are reminiscent of the modified silver coins used in older examples. Beads and ornaments were worn as early as 8000 B.C.E. by people living in the Southwest. The necklace examples shown here and in the drawers below date from 1100 C.E. to the early 1900s and demonstrate some of the ways Native Americans adapted raw materials to make spectacular adornments. Sometimes the materials came from what was locally available such as shells, seeds, and stones that were modified into beads. Other times the trade networks brought in more exotic materials including turquoise, corals, silver, and commercial cloth. There were and are no rigid rules for what could be worn, and the jewelry artist uses his or her own ingenuity. Tiles have been used as architectural decoration since ancient times in most cultures. In the 1840s the manufacture of medieval-style tiles was reinvigorated in England during the Gothic Revival. Tiles from the later nineteenth century were decorated in all of the revival and exotic styles, and in the early twentieth century in the Arts and Crafts mode. The examples here include molded relief tiles usually glazed with a single color; flat transfer-printed ones with narrative and geometric decoration that are either monochromatic or polychrome; and flat hand-painted ones. These tiles were used as decoration for walls and floors, and incorporated into furniture and mantelpieces, but they were also appreciated as singular works of art and framed and hung on the wall, as seen here. The Hopi—Pueblo people living in the southwestern United States—began making tiles for decoration in the nineteenth century. Their designs mirrored the abstracted motifs used on their pottery, such as the small bowls included in this case. Ceramics have a tradition in the southwestern pueblos dating from 7500 B.C.E. to the present day. Originally all pottery production was for Native use, and specific shapes, designs, and colors can be attributed to specific pueblos. By the early twentieth century, especially after the advent of the Santa Fe railroad in the 1870s, non-Native merchants and collectors passing through the region created a demand for portable Native tokens. Entrepreneurial Native potters made small bowls and decorative tiles using traditional Hopi and Pueblo designs to fulfill this commercial opportunity. A medal is a coinlike metal object bearing imagery—typically a portrait or allegorical picture on the front (obverse) side and related images or inscriptions on the reverse. With roots in ancient Roman coins and Renaissance models, medals were often produced in multiples for commemorative purposes. A branch of sculpture, the medallic arts reflect stylistic trends in larger-scale sculpture but present particular challenges to the artist, who must model the subject in low profile, called bas-relief. Generally, medals are struck, a process that involves pressing a blank disk of metal between two steel dies carved with negative images of the final design. Modern technological advances in the mechanical engraving of dies and hubs (positive stamps used to make dies), as well as the mechanical reduction of an artist’s design to a small format, have allowed for greater technical sophistication and artistic freedom. 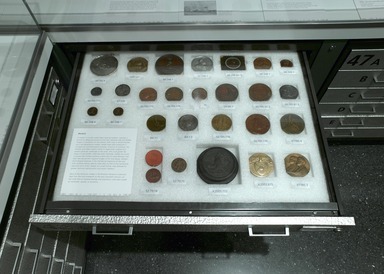 Most of the American medals in the Brooklyn Museum’s collection date from the mid-nineteenth to the early twentieth century—an era when the art enjoyed prestige and popularity—and were issued as memorials, awards, or souvenirs. September 4, 2008 More than 350 additional objects from the Museum’s renowned American holdings will be installed in the Luce Visible Storage ■ Study Center, bringing the total number of works on view in the Center to 2,500. These objects will be installed in forty-two publicly accessible drawers in a phased installation beginning in mid-October and continuing over several months. To celebrate this expansion, an exhibition of seventy highlights from the drawers and related objects from the collection, Small Wonders from the American Collection will be on view October 15 through June 28, 2009. 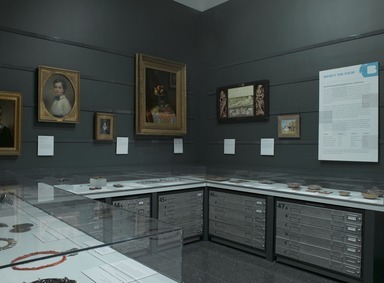 The drawers will contain of a wide range of objects from the Americas, including art of the United States as well as of the indigenous and colonial peoples of North and South America, and dating from the pre-Columbian period to the present day. Each drawer will be covered in Plexiglas, providing protection for and visual access to the objects. The works vary in medium, date, and geographical origin but share a diminutive scale and suitability for flat storage. Among them will be American and Hopi ceramic tiles, Mexican pottery stamps, jewelry and other ornaments from Native and South American cultures, modernist jewelry, silverplated flatware and serving pieces, Spanish Colonial devotional objects, American portraits and mourning miniatures, commemorative medals, and embroidery. Small Wonders from the American Collection, exploring a range of the cultural traditions and artistic practices that constitute American art, will be installed on the walls and in display cases above the drawers in an alcove created for temporary exhibitions. A variety of jewelry and other objects of personal adornment though produced by different peoples function similarly to signify information about the wearer’s identity. Flatware, pins, and other silver items reflect a broad array of forms, styles, and uses. Ceramic tiles made contemporaneously by Native and non-Native Americans provide opportunities for cross-cultural comparisons related to decoration and marketing. 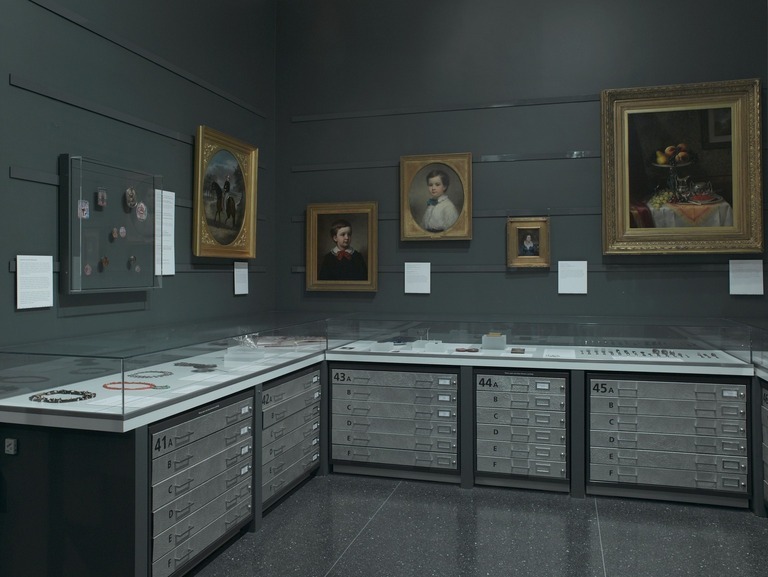 The Center, which opened in early 2005 with the installation of 2,100 objects in vitrines and on rolling paintings screens, provides greater access to the collections by presenting works in a more compact fashion than in a traditional gallery presentation. Objects in the Luce Visible Storage ■ Study Center are organized in much the same manner as they are in closed storerooms, by medium and type. Two large, glass-walled bays contain nearly six hundred paintings on rolling racks, which are periodically rotated; there are also more than thirty vitrined storage cases with Plexiglas walls for large- and small-scale three-dimensional objects such as furniture, silver, ceramics, glass, sculpture, and industrial design. Throughout the Visible Storage ■ Study Center, works are labeled with accession numbers, which may be entered in to nearby computers or at www.brooklynmuseum.org/research/luce to access detailed information about each work on display. Both the drawer installation and Small Wonders from the American Collection are organized by a team of curators who are responsible for various parts of the American collections, including Karen A. Sherry, Assistant Curator of American Art; Barry Harwood, Curator of Decorative Arts; Judith Dolkart, Associate Curator of European Art; Nancy Rosoff, Andrew W. Mellon Curator, Arts of the Americas; and Susan Kennedy Zeller, Associate Curator, Arts of the Americas. The Luce Visible Storage ■ Study Center is a part of the Luce Center for American Art.